MARIUPOL, Ukraine -- Thousands of steelworkers fanned out on Thursday through the city of Mariupol, establishing control over the streets and banishing the pro-Kremlin militants who until recently had seemed to be consolidating their grip on power, dealing a setback to Russia and possibly reversing the momentum in eastern Ukraine. By late Thursday, miners and steelworkers had deployed in at least five cities, including the regional capital, Donetsk. They had not, however, become the dominant force there that they were in Mariupol, the region’s second-largest city and the site last week of a bloody confrontation between Ukrainian troops and pro-Russian militants. While it was still far too early to say the tide had turned in eastern Ukraine, the day’s events were a blow to separatists who recently seized control here and in a dozen or so other cities and who held a referendum on independence on Sunday. Backed by the Russian propaganda machine and by 40,000 Russian troops just over the border, their grip on power seemed to be tightening every day. But polls had indicated that a strong majority of eastern Ukrainians supported unity, though few were prepared to say so publicly in the face of armed pro-Russian militants. When President Vladimir V. Putin of Russia withdrew support for the separatists last week, calling for a delay in the referendum and for dialogue on Ukraine’s future, the political winds shifted, providing an opening that the country’s canny oligarchs could exploit. The workers who took to the streets on Thursday were among the hundreds of thousands in the east who are employed in metals and mining by Ukraine’s richest man, Rinat Akhmetov, who only recently went beyond paying lip service to Ukrainian unity and on Wednesday issued a statement rejecting separatism. Critics say Mr. Akhmetov could have prevented much of the bloodshed in the east if he had taken a strong stance sooner. But his lieutenants say he decided to confront the separatists out of a deep belief that independence, or even quasi-autonomy, would be disastrous for eastern Ukraine. Mr. Akhmetov urged his employees, whose jobs were at risk, to take over the city. The workers, who were wearing only their protective clothing and hard hats, said they were “outside politics” and were just trying to establish order. Faced with waves of steelworkers joined by the police, the pro-Russian protesters melted away, along with signs of the self-declared Donetsk People’s Republic and its representatives. Backhoes and dump trucks from the steelworkers’ factory dismantled the barricades that separatists had erected. Metinvest and DTEK, the metals and mining subsidiaries of Mr. Akhmetov’s company, System Capital Management, together employ 280,000 people in eastern Ukraine, forming an important and possibly decisive force in the region. They have a history of political activism stretching back to miner strikes that helped bring down the Soviet Union. In this conflict, they had not previously signaled their allegiance to one side or the other. It remains possible that the separatists could regroup and challenge the industrial workers, though few were to be found in and around Mariupol on Thursday, even in the public administration building they had been occupying. “We have to bring order to the city,” Aleksei Horlov, a steelworker, said of his motivation for joining one of the unpaid and voluntary patrols that were organized at Ilyich Iron and Steel Works. Groups of about six steelworkers accompanied two police officers on the patrols. “People organize themselves,” he said. Workers from another mill, Azovstal Iron and Steel Works, took one side of the city, while the Ilyich factory took the other. Both groups were trying to persuade longshoremen to patrol the port, Mr. The two steel mills fly Ukrainian flags outside their headquarters, though like so much else in Ukraine, the lines of loyalty are muddled. At least a portion of the police in the city mutinied last Friday, leading to a shootout with the Ukrainian National Guard that killed at least seven people. The chief executive of Ilyich Steel Works, Yuri Zinchenko, is leading the steelworker patrols in the city. He said the company had remained on the sidelines as long as possible, while tacitly supporting unity with Ukraine by conveying to workers that a separatist victory would close export markets in Europe, devastating the factory and the town. Though the workers had differing views of the new government in Kiev, the Ukrainian capital, on the whole they supported the patrols to restore order, employees and managers said. “Everybody can have their own opinion, but not at work,” Sergei Istratov, a shift boss at the factory, said. Once patrols began, he said, representatives of the Donetsk People’s Republic visited the Ilyich factory, demanding to know what was happening. “They were not very friendly at first,” Mr. Ryzhenkov said. But the patrols were welcomed in town, he said, and militants had little option but to acquiesce, at least in Mariupol. “The Donetsk People’s Republic understands if they attack unarmed local people, they will lose all support here,” he said. The effort is more than ad hoc. If the patrols are successful, they said, they will try the tactic in most major cities in the Donetsk region, though not in Slavyansk, a stronghold of pro-Russian militants where Metinvest and DTEK have no factories or mines. 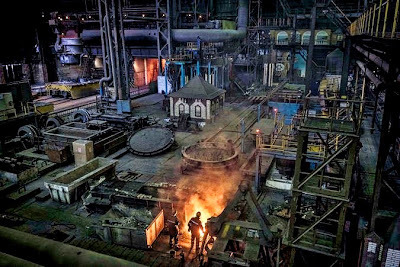 Ilyich Iron and Steel, a grimy scene of mid-20th-century industrial sprawl, is one of Ukraine’s most important factories, producing five million tons of slab steel a year. 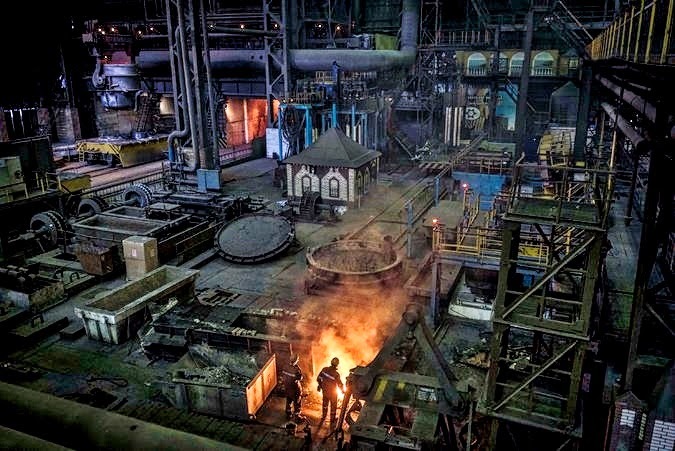 About 50,000 people work in the steel industry in Mariupol, a city of 460,000. So far, 18,000 steelworkers have signed up for the patrols, Metinvest executives say. “There’s no family in Mariupol that’s not connected to the steel industry,” Mr. Zinchenko said in an interview at his desk, which was decorated with a miniature Ukrainian flag. He said he had negotiated a truce with local representatives of the Donetsk People’s Republic, but not with the group’s leaders. Mr. Akhmetov’s statement detailed the daunting problems facing the regional economy — and his assets — if the Donetsk People’s Republic were to win its struggle with Kiev. “Nobody in the world will recognize it,” he said in a videotaped statement. Russia itself exports steel, so it has never been a significant market for the output of the Donetsk region. Residents welcomed the steelworker patrols for bringing an end to chaos and insecurity. They said masked men had robbed four grocery stores, a shop selling hunting rifles and a jewelry store, and that they had burned down a bank. The crowds of pro-Russian protesters who had jeered and cursed Ukrainian soldiers last week were nowhere to be seen. On the city’s central square Thursday afternoon, a pro-Russian rally drew a few dozen protesters, who were watched over by a group of steelworkers. The government in Kiev rebutted reports that the police chief had been found hanging and dead in the town. He had indeed been kidnapped by gunmen and was severely beaten, the Interior Ministry said, but he was eventually rescued. “There are a lot of idiots with guns in my city,” said Aleksey Rybinsev, 38, a computer programmer who added he welcomed the new patrols, though he feared they might develop into another informal militia group.